I just got this ad in a Google search this morning. Someone needs to tell Sam the election’s over! 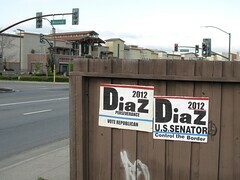 A Tea Party event will be held in San Jose this Thursday ~Tax Day. Over 5,000 are expected to attend. Apparently Barbara, CALL ME SENATOR, Boxer has written a second book called Blind Trust. I hadn’t realized that there was a first book, or that she could even write. For what it’s worth she is scheduled to appear in San Jose for a book signing. Recently, the only somewhat Santa Clara-centric blog Mission City Lantern had been posting speculations about possible identities behind Revealed, but little conclusive evidence. In their latest post, Inside are effectively claiming that several of the people named by the Lantern are working together to direct Revealed’s blog, though admitting that a not-yet-identified third party may actually be writing Revealed’s words. The people named by the Lantern and Inside are a fairly close group of advisers around former city councilmember Cindy Chavez, who ran for mayor in 2006. The Lantern specifically identified Revealed to be Philip Bump, formerly political director of the South Bay Labor Council, of which Chavez is currently CEO. In return, Revealed has posted a denial that the other blogs have him correctly identified. I’ve always read Revealed as the kind of blogger who likes to poke a stick into a hornet’s nest, just to create some excitement. He has a certain group of local political figures who he regularly jabs at, and reading his stuff has been like watching over-the-top political rhetoric brought to the local stage. He strikes me as the “Rowdy” Roddy Piper of local politics. I always figured the people he took issue with were all grown-ups and could certainly stand up to Revealed’s somewhat clownish jeering. On the other hand, I haven’t been reading Revealed long enough to see some of the more mean-spirited things Inside and the Lantern have pointed out, such as posting a map to the home of political aspirant (and gang prosecuting attorney) David Pandori’s. This, at least, clearly crosses the line from entertaining political bloviation to dangerous invasion of privacy. On Monday evening, District 6 councilmember Pierluigi Oliverio is presenting a movie screening in the San Jose City Council chambers. The film, I.O.U.S.A., is a documentary meant to explain the US national debt, and what it means to future generations. The film has received favorable reviews from, for example, Roger Ebert of the Chicago Sun-Times. I.O.U.S.A. was produced by a nonpartisan organization called the Concord Coalition, which advocates fiscal discipline in government. It was founded by a democratic and a republican senator in 1992, and its board of directors includes former Secretary of Treasury Robert Rubin, and former Chairman of the Federal Reserve Paul Volcker. When: Monday, May 4, 7:00 – 9:00 pm. Where: City council chambers, 200 E. Santa Clara St.